The Overalls, a 90’s staple that we thought we would never see again. There seem to be a lot of 90’s pieces coming back to life this year. They are reborn with a modern edge, of course. I still have my “First Day of Kindergarten” picture wearing light washoveralls with my bright white Keds. I did not imagine myself wearing those fifteen years later. Though just overalls in general are coming back in style, I have mostly seen them worn as cuffed shorts. There are so many different ways to style overalls, especially when picking out a top. If you want to be a tad bit edgy and take a risk you could pair them with just a lace bandeau top. If you choose to cover up a little bit more, you could opt for a crop top to show some skin without showing too much. For my personal style, I go for a “less is more” look for outfits like these. My favorite way to wear overalls is with a plain oversized tee and some Chuck Taylors. 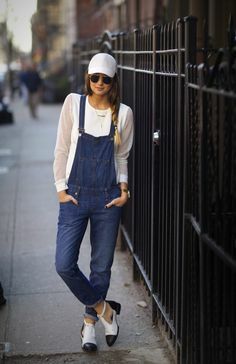 I am excited to see how girls will start styling long leg overalls when fall and winter come around. I predict it will lean more toward a tougher side with some combat or ankle boots with metalhardware. Like all trends, I am sure it might seem very different but when vintage pieces like a pair of overalls are styled with a modern and fresh look it can completely change your mind.